In the third pAsuram, AzhwAr is meditating upon emperumAn‘s acceptance of SiSupAla which is greater than bringing along those who don’t think about anything other than emperumAn himself. Subsequently, AzhwAr explains emperumAn‘s greatness of liberating SiSupAla who performs unfavourable acts, beyond just eliminating the unfavourable aspects and protecting [the followers]. kEtparO – will they hear? SiSupAla, an age-old enemy from distant past kept saying lowly, harsh words and scolded krishNa, the unconditional lord, to cause burning sensation for the ears of even those who are desirous to hear about defects in bhagavAn’s qualities; [yet] he attained sAyujyam at the divine feet of such krishNa; even after knowing those very wise persons who know the distinguished nature of krishNa, will those who are supposed to be hearing (about salvation), hear the greatness of any other entity who liberated those who did not avoid his help, than that of krishNa, the killer of kESi? kEtpArgaL – Previously, AzhwAr said “kaRparO” (will they learn?). That is, to ensure that he is firmly placed in the heart, in the beginning, during the course and at the end; now, hearing means when someone who has him firmly placed in his heart [AchArya] instructs, faithfully pondering upon it and accepting it. Though one may not have full clarity in the heart during the course of time, at the end, the result will be the same for both [the AchArya who instructs and the Sishya who hears]. Even if one is not learned, at least he should have heard it [kuRaL 414 reflects this same meaning]. Being faithful upon hearing what was learnt and fully understood. Though one is not fully learned and not engaged in the kainkaryam which is the culmination of such learning, at least if one hears these principles from an AchArya, it will help when one is in danger. Now [during the course of time here], the loss for self is to be unable to explain these principles to others and not having full clarity in the heart. kEtpArgaL – One who has an opening in the ear [i.e. everyone]. The only purpose of ears is to hear bhagavath vishayam; it is said in periya thirumozhi 11.7.2 “kELAch chevigaL cheviyalla kEttOmE” (we have heard that, those ears which do not hear bhagavath vishayam, are not considered as ears); it is only like a rat hole. kEsavan kIrththi allAl – Would they hear the glories of anyone other than krishNa who is the eliminator of enemies? He did not wait until becoming a youth to eliminate the enemies; right from the toddler stage he started eliminating enemies such as pUthanA et al. He did not eliminate the enemies intentionally, but it was an act of sustaining himself. Poison kills not due to having knowledge [it is just its nature]. SrI vishNu purANam 5.16.14 “vyAdhithAsyO mahAraudhras sOsura krishNabAhunA …” (having widely open mouth, and looking very frightening, the demon horse fell down being torn apart by krishNa, like a tree felled by thunder strike) – kESi had his mouth open and appeared to instill fear on those who saw him. Toddlers usually place their hand in any hole, playfully. In that manner, krishNa stretched his hand into its mouth, and due to the new experience, the hand grew; at that time, kESi fell down in two pieces like a tree which was struck down by thunder. maRRum kEtparO – Would they even listen to the incidents of SrI rAma’s life which was explained previously? How amazing is AzhwAr’s nature! Previously he said “irAma pirAnai allAl maRRum kaRparO” (would one learn anyone other than SrI rAma, the benefactor?) Here, he is saying “kEsavan kIrththi allAl maRRum kEtparO”; what is the reason for this? When AzhwAr enjoys rAmAvathAram he says in thiruvAimozhi 3.6.8 “thayaradhaRku magan thannai anRi maRRilEn thanjamAga” (other than such SrI rAma, who appeared as the son of dhaSarathi chakravarthi, I will not have any one, even another form of bhagavAn, as my refuge); when he enjoys krishNAvathAram he says in thiruvAimozhi 2.2.1 ” nam kaNNan kaNNallathu illai Or kaNNE” (krishNa is the supreme controller for the universe and there is no other controlling entity that exists); in this manner, he is the only one who is capable of immersing in the particular incarnation he enjoys. Just as when one immerses in one quality of emperumAn, he cannot pursue other qualities of same emperumAn, when one immerses in a particular incarnation, he cannot pursue other incarnations as well. kEtpAr sevi sudu kIzhmai vasavugaLE vaiyum – Here, it is not explained in the same way as “kEtpAr” was explained previously [i.e. as all those who have ears]; here, this means, those who are interested to hear the lowly scoldings only. Speaking such harsh words that even those lowly people who would pay to accuse bhagavAn, would become disturbed, would close their ears and say “You are speaking so harshly; you cannot speak like this”. vasavugaLE vaiyum – Even the followers of emperumAn, due to being associated with a [material] body and due to forgetfulness, would sometimes engage in unfavourable acts; similarly, would he sometimes, accidentally say a good word? With the “EvakAram” [i.e. the long syllable E in vasavugaLE], it is emphasised that, there is no such possibility. The reason for this is explained further. sEtpAl pazham pagaivan – Having great enmity right from his birth; not just this birth, even from previous births, he has been an enemy; there is no end to the offenses he committed in every birth; there were many such births. Due to long standing enmity, the lengthy duration of each of such births and the abundance of offenses committed in those births are considered. Even if he is speaking unknowingly, due to his vAsanA (inclination), it will end up being offensive only. A new born calf will itself seek the udder of the mother cow, due to the inclination from previous births; similarly, his enmity in this birth is due to the inclination from previous births. thiruvadi thAL pAl adaindha – Attained proximity to the divine feet of sarvaswAmi (lord of all). It is defining the nature of sAyujya mOksham. That is to engage in eternal kainkaryam, without any break, being in close proximity of the divine feet. sAyujya does not mean merging of AthmA and brahmam – that [principle of merging] is not what is explained in muNdaka upanishath 3.2 “brahma vEdham brahmaiva bhavathi” (one who knows brahmam, becomes similar to that), muNdaka upanishath 3.1.3 “paramam sAmyam upaithi” (he attains supreme equivalence), periya thirumozhi 11.3.5 “thammaiyE nALum vaNangith thozhuvArkku thammaiyE okka aruL seyvar” (emperumAn will bless those who worship him to become similar to him), SrI bhagavath gIthA 14.2 “mama sAdharmyam AgathA:” (having attained equanimity with me) and bOdhAyana vruththi “samAnO jyOthishA” (Similar to paramAthmA); instead it speaks about the equivalence in the resulting enjoyment between emperumAn and the AthmA; since it is said in brahma sUthram 4.4.17 “jagath vyApAra varjam” (they (nithyas, mukthas) have all capabilities except engaging in activities related to material realm) and brahma sUthram 4.4.21 “bhOga mAthra sAmya lingAthcha” (Having similar identity in enjoyment only), sAyujyam does not mean as in rAmAnusa nURRandhAdhi 58 “avanOdu onRAm” (becoming one with him), but it means “serving his divine feet” as it is also said in parama samhithA “sAyujyam prathipannAyE thIvra bhakthAsthapasvina: | kinkarA mama thE nithyam bhavanthi nirubathravA:” (Those great devotees, who performed upAsana and who became uplifted attaining equivalence with me, will be freed from all hurdles and will always be my servitors). thanmai aRivArai aRindhumE – Identifies the target for those who should hear. Will those who know persons with such knowledge and hear from them, hear anything other than kESava’s glories? How did SiSupAla attain emperumAn‘s divine feet? He angrily shouted saying the divine names, and could have remembered the beautiful posture of emperumAn with his divine chakra in his hand, at the final moment [before being killed by krishNa using his chakra]. If we superficially analyse, we could highlight some reasons in this manner. If we try to highlight a reason for this, that will minimize the greatness of his krupA (mercy). AzhwArs, rishis and everyone would explain “SiSupAla attained sarvESvaran’s divine feet by his grace”. Even if he acquires up to parama bhakthi (ultimate state before liberation), weren’t the faculties given by ISvaran himself? As even this reason becomes irrelevant, it is not meant for us to try and highlight a non-existing reason. [Another view point on SiSupAla’s attaining mOksham] ALavandhAr mercifully said “SiSupAlan did not get liberated”. When asked “How do you say that?’, he mercifully replied “since he did not have the means [i.e. 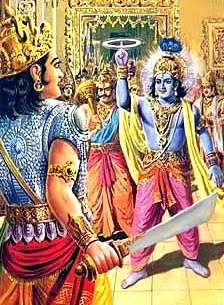 desire] to go to paramapadham; to stop him from harming the world, emperumAn picked him up and threw him into a corner [of paramapadham, as a criminal would be banished and thrown out from the kingdom]”. Here it is simply saying that the vastness of emperumAn’s qualities [mainly krupA] will become minimized, if we say that SiSupAla angrily recited emperumAn’s divine names and hence got mOksham, or kAkAsura was pardoned due to falling at his divine feet, since it is said in SrIrangarAjasthavam 3.97 “balibhuji SiSupAlE thAdhrugAkaskarE vA guNalavasahavAsAth thvathkshamA sankuchanthI” (Your patience which became minimised due to some good aspects in kAkAsura and SiSupAla). periyAzhwAr too said in 4.3.5 “pala pala nAzham sollip pazhiththa sisupAlan thannai – alaivalaimai thavirththa azhagan” (The beautiful emperumAn who eliminated the blabbering of SiSupAla who accused emperumAn in many ways). thiruchchandha viruththam 111 “vaidhu ninnai vallavA pazhiththavarkkum” (attainable even for the one accused you with faults). The greatness in this pAsuram – Is it great to say that SrI rAma took along those who could not live without him or is it great to say that emperumAn gave the same result to even SiSupAla who committed grave offense against him? This entry was posted in thiruvAimozhi, thiruvAimozhi 7th centum on September 6, 2018 by Sarathy Thothathri.